This is part four of a very long trail of posts about our beautiful daughter, Lara. If you haven't read the first three parts - Build Up To Lara's Birth, Lara's First Week and Lara's Second Week - already, now is a good time to do so and come back. It'll put a lot of what is said here into context. Lara's third week didn't start off too well. Unfortunately, her little tummy couldn't always handle the 46ml on every feed - some feeds she'd keep the lot down, others she'd get very uncomfortable and bring up some of her milk. 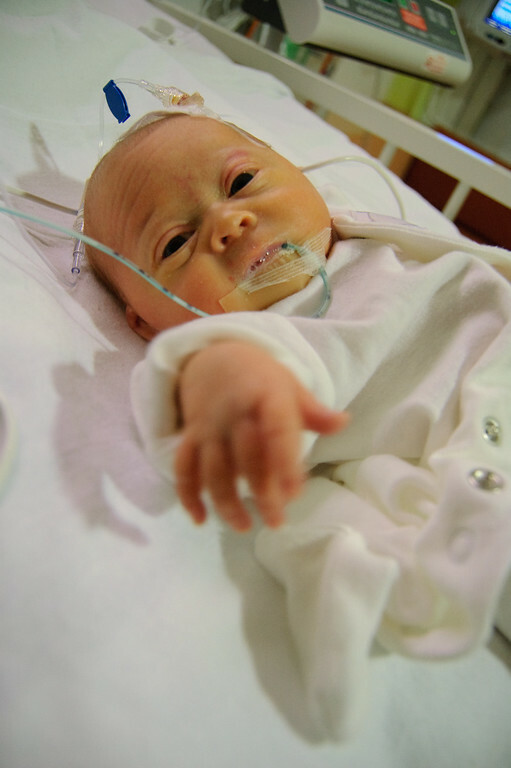 Accordingly, the doctors dropped her feeds back down to 40ml every 3 hours and started supplementing the expressed breast milk (EBM) with SMA Gold to increase the calorie and nutrient profile to try speed the weight gain up a bit. This seemed to be kinder on her tummy and she managed to keep hold of her feeds again. The end of the 3rd week brought good and bad news. First the bad news: Lara lost weight. She dipped back under 2kg. Apparently the doctors were expecting some weight loss to continue after the diuretics were stopped and her feeds reduced slightly. With these in mind, and given that she'd been more active and appeared strong and healthy, they weren't too concerned by this. They did however decide to keep her feeds at 40ml every 3 hours but change them to be made up of 50% Infatrini (a prescription only high calorie baby milk), 48% breast milk and 2% SMA Gold. The huge boost in calories should have seen her packing on the pounds in no time. Now the good news. During the doctor's ward round on the Thursday, they tentatively scheduled the surgery for the morning of Monday 15 February. This wasn't set in stone and we were advised that they may need to bring it forward or postpone the operation depending on Lara's health and how she continues to handle the prostin. As you can no doubt imagine, we were very happy with this news. Finally a little glimpse of light was appearing at the end of the tunnel. We did however hold back a bit as we know things do change. Other than that, Lara's third week was a very quiet week.